EASTON, PA--(Marketwired - March 18, 2016) - "I live for the moment," says Sam Leccia, founder of Leccia Tobacco and the creator of Oliva Nub and Cain cigars, Leccia Black, White, and Luchador cigars. "That unexpected, unanticipated moment when everything is just right with the world. They happen every day if you look." Having achieved unprecedented success as a master blender, listeners can learn more about what drives Sam Leccia as interviewed by Gary Korb on the next "Cigar Masters" podcast, which is streamed via CigarAdvisor.com. One of those unexpected moments came a little over 14 years ago when Sam, who was working for Bacardi Rum at the time, visited the Camacho Cigars factory in Danlí, Honduras. Getting to see the detailed craft of making premium cigars up close and personal provided Sam with the motivation to play a role in the premium cigar industry. Yet, at the time, not even Sam knew that six years later he would be known as more than just a maestro torcedor, but a true innovator and one of the architects of the boutique cigars revolution. Sam's passion for tobacco started in his garage, where he would take different cigars, unroll them, remove the leaves, and then re-roll his own custom blends. At first, he admits he didn't know what he was doing, but eventually, he acquired a nose and a palate for the myriad varieties of tobacco and learned what combinations of leaves worked best. During the podcast, Sam talks about how he discovered Kentucky fire-cured tobacco by accident when looking for the tobaccos that would be used in his Leccia Black cigars selection. "Drew Estate was working with fire-cured leaf for their KFC cigars around the same time," says Sam, "But it was more coincidence than anything else. I only use a quarter of a leaf in my Black line, which gives the blend that little extra note of flavor." When asked about why he uses so many different tobaccos in his blends, Sam points out that his approach to blending is like creating a recipe. "I can taste every one of those tobaccos in the blend," he says, and hopes that cigar smokers are able to pick up all those flavor nuances as well. One of the highlights of the podcast includes what to pair with the Leccia, Black, White, Luchador and Luchador El Gringo cigars. According to Sam, any liquors that have been aged in charred oak barrels pair well with the Leccia Black. Hoppy beers, like IPAs and some Porters go well with the White, while the Luchador was made to be paired with Tequila. Sam also points out that drinks that coat the palate like dark rums, bourbons, and even wine are best for pairing with cigars, especially coffee. Like most cigar blenders, Sam is continually working on new things. 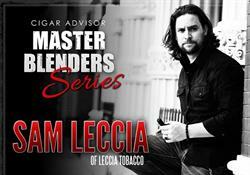 As to what's next for Sam and Leccia Tobacco, he couldn't be very specific, but he did indicate that it was something so different, "it's going to be an entirely new category for premium cigars." To listen to the complete Cigar Advisor podcast with Sam Leccia, click here. Cigar Advisor, the nation's premiere online cigar magazine, proudly serves cigar enthusiasts with a uniquely down-to-earth perspective on the enjoyment of premium cigars. Well-known and highly regarded for providing acclaimed educational cigar content and behind-the-scenes industry articles from some of the business's top names, the Cigar Advisor editors deliver an array of content that speaks directly to those who enjoy the cigar lifestyle.